Thicker and softer than some other swabs, BD™ Alcohol Swabs ensure reliable site preparation for safe, hygienic insulin injections. 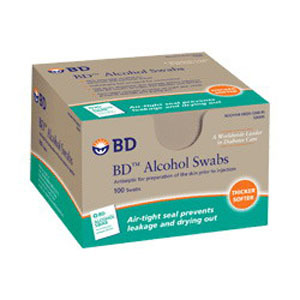 BD™ Alcohol Swabs are also excellent for many other household uses. Individually foil wrapped for convenience. Four-layer wrapper provides air-tight seal which prevents leakage and drying out.